On Monday, Lapp sent another message: There was again an “unconfirmed bomb threat” in those four campus building; meanwhile, a swarm of law enforcement officials were combing through the same classrooms and common rooms in search of explosives. In both cases, police deemed all four buildings safe following an investigation. The eerie familiarity of the threat, together with the recency of fatal bombings in Paris and Beirut, imbued the series of evacuations and investigations on Monday with particular weight for some students. And some students, particularly juniors and seniors, recalled a day in 2013—when then-sophomore Eldo Kim sent Harvard officials an emailed bomb threat—with particular clarity on Monday as similar events unfolded throughout the afternoon. 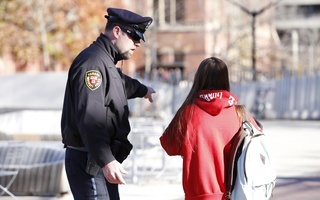 Kim’s bomb threat, which he later confessed was an attempt to skip a final exam, resulted in evacuations of the Yard and canceled examinations. Later in the afternoon, while she waited in the cafe for updates on the bomb threat investigation, Fuentes recalled the 2013 story to one of her sophomore friends who had not been a College student at the time. 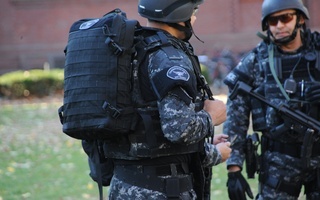 And though many classes in the Yard were canceled while law enforcement officials conducted their search, Philip J. Abboud ’17 said he thought the bomb threat Monday drew a “less concerned” response from Harvard officials than did the 2013 threat. While the investigation lasted hours into Monday afternoon, some buildings reopened to students and faculty and many classes scheduled to take place were not altered. Once Sever and Emerson Halls were deemed safe, Leslie A. Kirwan ’79, the Faculty of Arts and Sciences’ dean for administration and finance, sent an email to FAS affiliates encouraging professors to continue classes as normal. “[I]n the interest of minimizing the need to reschedule classes, faculty and/or TFs who have classes or sections in Sever and Emerson are encouraged to hold them if possible,” she wrote. Still, though, the recent attacks in Paris and Beirut—which left scores dead—evoked a more somber tone to Monday’s attacks for some Harvard students, faculty, and administrators. “In the wake of recent tragic events in locations ranging from Paris to Beirut and beyond, we understand that this type of threat will cause great anxiety for many across our campuses,” Lapp wrote in her initial email to Harvard affiliates. Even for some students who were skeptical of an actual bomb threat, the recent events made Monday’s evacuations feel more legitimate. Alarms in Sever Hall ended History professor Peter E. Gordon’s class, Culture and Belief 50: “The European Postwar,” early. Astronomy professor Jonathan E. Grindlay, who had to cancel his class, Science of the Physical Universe 21: “Stellar Understanding of the Cosmos,” said it was “disappointing” that a bomb threat disrupted campus, especially in the wake of the Paris attacks. 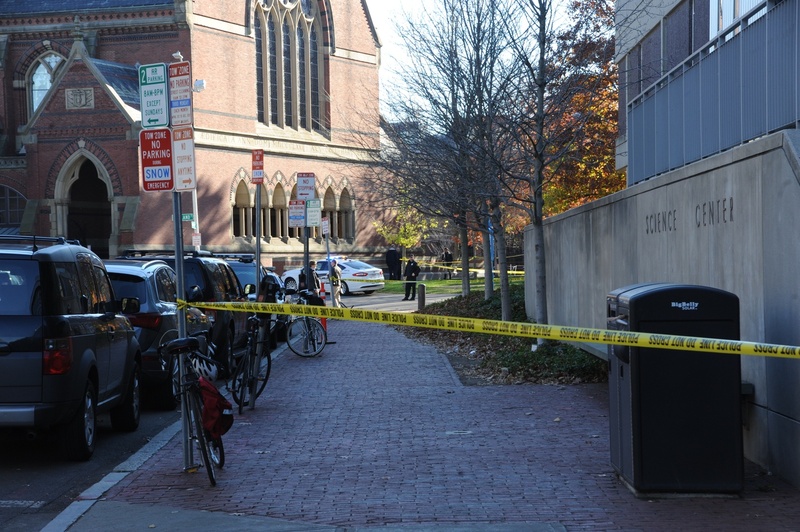 An unknown individual called 911 in Cambridge on Saturday to report that a bomb was located in the Harvard Coop cafe.